A traditional Italian food dish made with veal shanks dredged in flour, chopped vegetables such as onions, celery, tomatoes, and carrots, that cook together in a chicken or beef stock with seasonings such as olive oil, garlic, marjoram, pepper, thyme, and white wine. Translated to mean bone with a hole Osso Buco combines many savory ingredients to create a very flavorful and hearty dish. 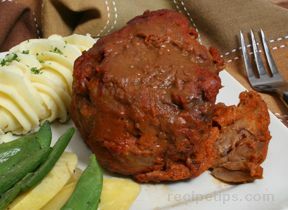 When preparing this popular Italian food, the veal shank is sliced crosswise about 3/4 inches thick (averaging 1 pound in weight) retaining the bone and marrow to add additional flavor to the meat. As a means to reduce the richness of Osso Buco, a lemon gremolata is prepared as a garnish, using the grated rind of a lemon (lemon zest), lemon juice, a garlic clove, and fresh parsley combined together and added over the osso buco after it is served. 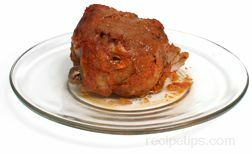 Osso Buco may also be referred to as Ossobuco.